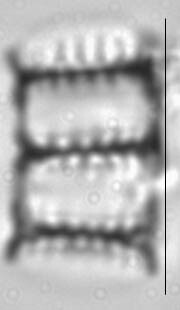 Cells are rectangular in girdle view and form ribbon-like colonies joined by linking spines. Valves are round to slightly elliptical. The valve face is flat, or slightly undulate due to raised costae. Valve face/mantle junction forms a sharp angle. Abvalvar edge of mantle in middle portion of valve is convex with respect to the valve face/mantle junction. The axial area is narrow to widely lanceolate, or may be linear in some specimens. Striae are distinct, alternate, and composed of round areolae decreasing in size from valve face/mantle edge to both central sternum and valve mantle. Areolae bear finely and profusely branched volae. Flaps partially cover the external opening of the areolae, especially on mantle areolae. Striae vary from parallel to radiate. Striae extend onto the valve mantle, further in smaller specimens. Costae are broad and wider than striae. 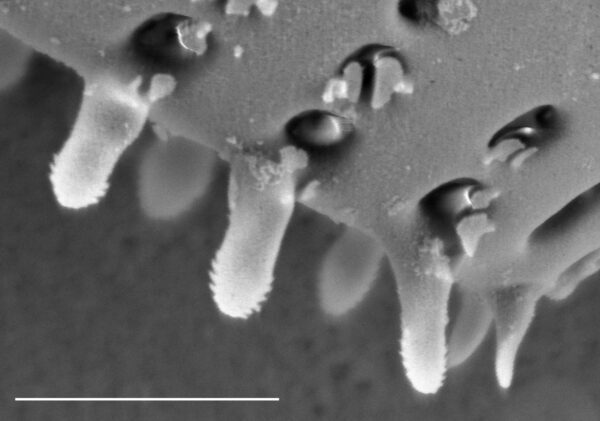 Spines are spatulate, solid, possess a serrate margin and bear flaps at the base, which cover the openings of the contiguous areolae. 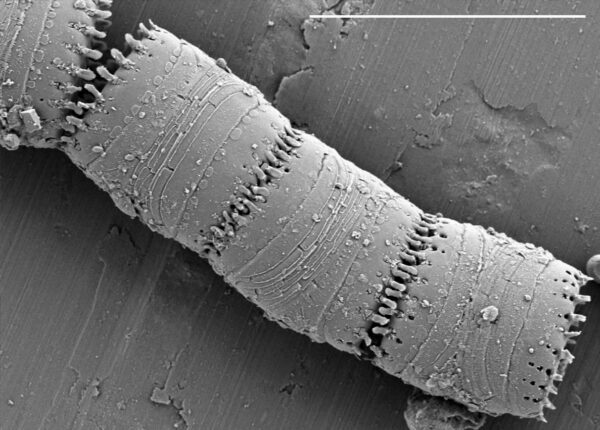 Spines are positioned within the striae at the valve face/mantle junction. Apical pore ﬁelds absent, or reduced to two to three pores located on valve face/mantle junction. Rimoportula are absent. Scab-like structures, or blisters, are present in some specimens as depositions on the abvalvar edge of mantle. Copulae are open and lack perforations. Valvocopula are wider than other copulae. 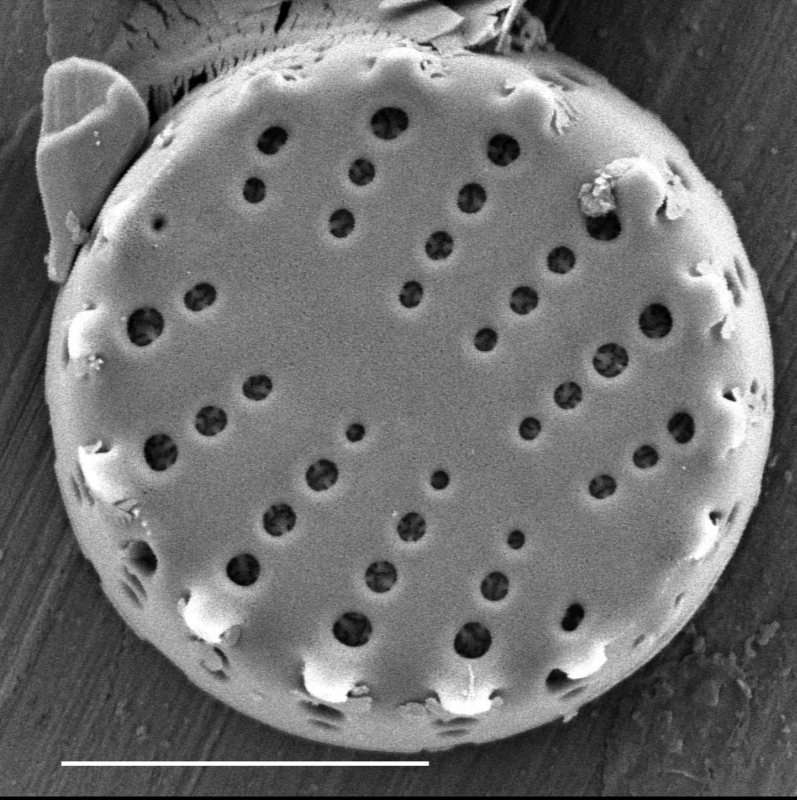 Plastids were not observed. This taxon has been commonly reported as Staurosira elliptica (Schumann) Williams and Round. This was due to a misinterpretation of the type of Fragilaria elliptica Schumann. 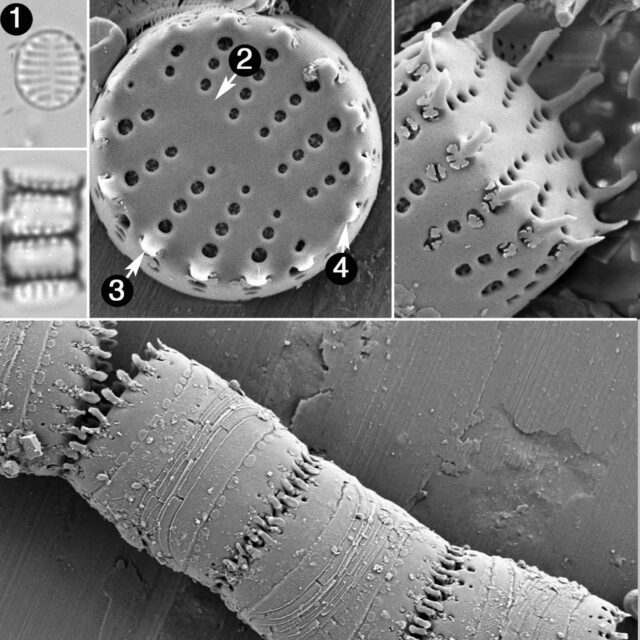 The type of F. elliptica has been evaluated (Edlund et al. 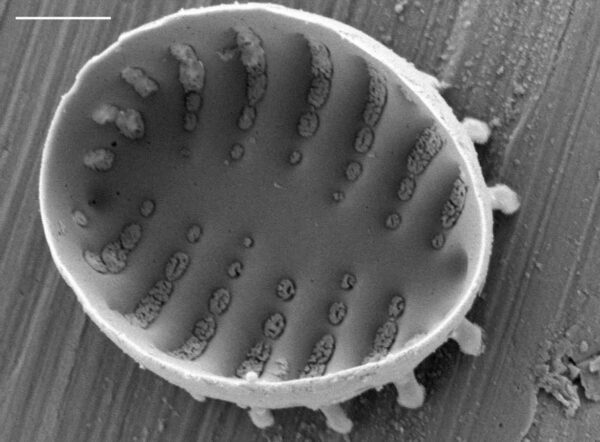 2006) and not only is it better placed in the genus Pseudostaurosira, Staurosira elliptica has not been confirmed in North America. 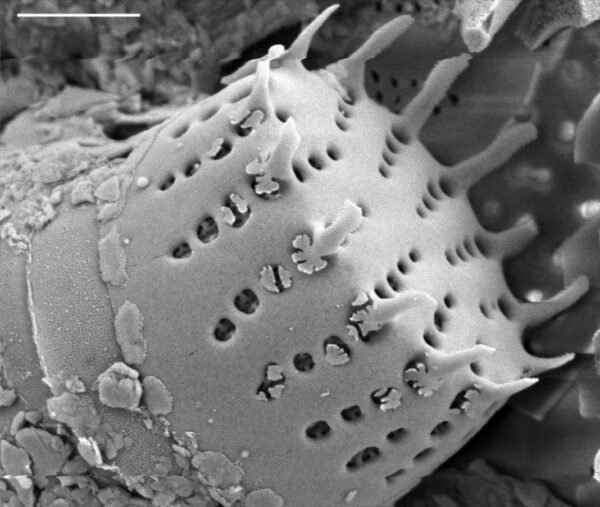 Pseudostaurosira elliptica (Schumann) Edlund et al. 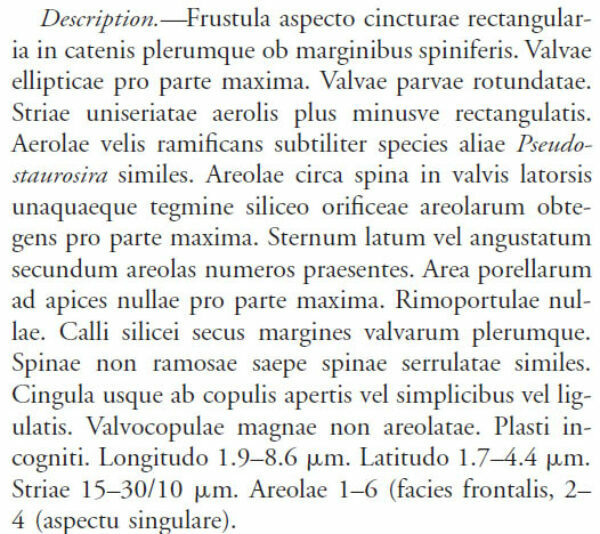 has elliptical valves with acute ends, striae restricted to the valve margin, but lacks serrate spines - all features differ from those of P. trainori. 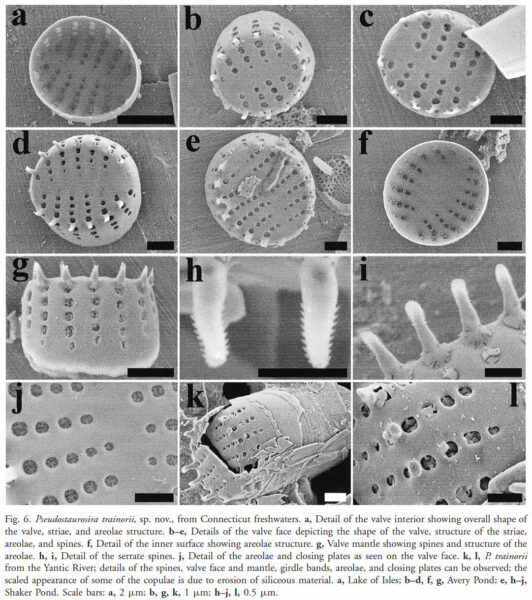 Colonies are presumably attached to the substratum at one end by a frustule attached by a mucilage pad, or planktonic.